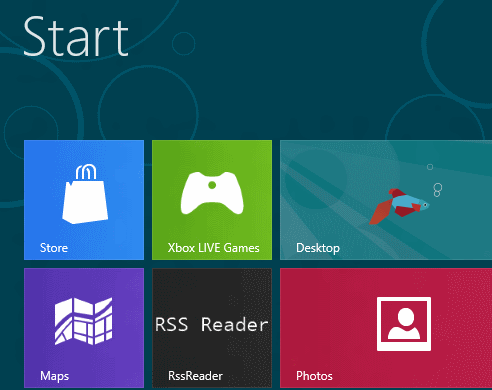 Metro RSS Reader is a free RSS reader for Windows 8 Metro interface. 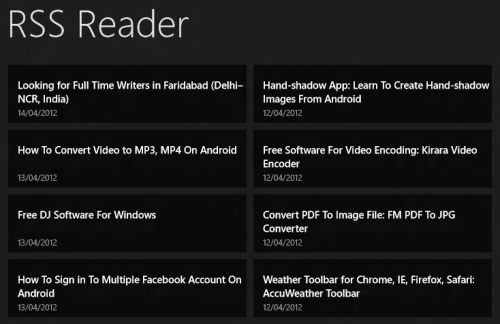 This RSS reader Metro app integrates with metro interface of Windows 8, and gives you one click access to your favorite RSS feed. This RSS reader shows a list of all the items in your feed, and lets you quickly read any item. This RSS reader for Metro interface is still quite new, and has some bugs that need to be squashed. Apart from that, some almost essential features are missing. Nevertheless, the interface is beautiful, and I really hope this RSS reader comes out with a further improved release, and becomes available via app store too. Note: This RSS Reader is not available in app store at the time of writing of this article. So, you will need to follow a longer method to install this RSS reader. First, check out our previous article about How to Add App to Metro Interface without Using App Store. Follow the steps mentioned in that article to install Developer license of Windows 8. After that, head over to homepage of this RSS reader here, and download the zip file. This zip file will have many folders, one for each version of OS (32-bit, 64-bit, ARM, etc.). Open the folder that corresponds to your version of Windows 8. 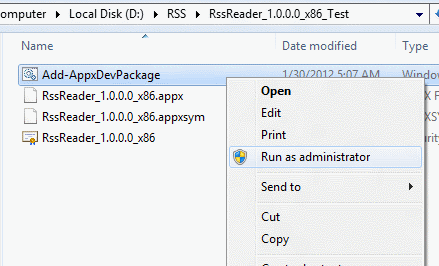 In that folder, right click on “Add-AppxDevPackage” file. In the right click menu, click on “Run as Administrator”. A warning box will appear. Accept that. After that, a command prompt will open which will show installation going on. Once installation is done, just go to your Metro UI, and you will see app for RSS reader installed there. Click on the app to see all the items in the feed. With each feed item, it shows headline of the item, and date of that item. 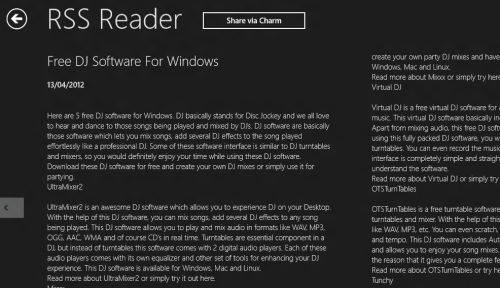 This RSS Reader for Windows 8 comes with a default feed. You can easily change that. Once the RSS reader is open, right click on that. It will show a bar at the bottom in which you can provide feed address. Just replace the default feed with any feed that you want, and click on save. The Metro RSS reader will then show posts from that feed. To read any feed item in detail, just click on that to open that feed item in full Window. Apart from that, it also comes with “Share” option that lets you share feed items with anyone. Along with “Share” it also shows a “Read More” button. Just click on that button to open that feed item in your browser, so that you can go to original website of that feed item. There is also a search box that lets you search within all the posts of your feed. As I mentioned in the beginning, this RSS reader for Windows 8 metro interface is still in its infancy, and needs some improvement. First of all, it needs to go to Windows 8 app store. That will make the installation quite simple. The current longer way of installation is not very friendly. Apart from that, there has to be options for adding multiple feeds. Currently it supports just one feed at a time which is not what a feed reader is used for. Till the time that happens, you can use online applications to combine multiple RSS feeds to create one feed, and then use that feed address in this RSS reader. There needs to be way to distinguish between read and unread items. It would be great if it shows number of unread apps in the Metro tiles, so that I don’t even have to click the RSS reader to see if there are any unread items. And most importantly for me, this needs to be integrated with Google Reader. I use Google reader a lot, and use only those feed readers that can integrate with that. This ensures that if I have read an item in one particular place, it is marked as read in all other places / devices that I use to read my feeds (web, desktop, my Android phone). The posts open up without any images. All the images from the post are stripped. That makes it quite difficult to follow through the posts if they have reference to images. While testing this, it crashed on me a few times. Whenever I click on any item in the feed list, always the first item opened. Despite all these shortcomings, I quite liked Metro RSS reader because it is beautiful, and fits well within the metro interface. Apart from that, it is very easy to use as well. I hope Zubair (developer of this app) takes care of these feature requests, and I am sure this app will become one of the popular RSS readers for Metro interface of Windows 8. Download Meto RSS Reader here. Great review, these shortcomings will be addressed in the future releases. Readers are advised to check the official homepage of this project http://metrorssreader.codeplex.com for updates and post any comments/feedback. in addition to the suggestions above… the developer should also make a tile view that either auto-scrolls through thumbnail snapshot of the unread stories. If they cant quite figure that out quickly though, an acceptable short term would be text only of 5 – 10 unread feed in the windows tile on that screen. Something to give us a preview of the stories we will see when we open it.